The Fidelitas Medal, which is bestowed annually, is the highest honor and most prestigious award given by the Orchard Lake Schools. Since its inception in 1949, the OLS Fidelitas Medal has been presented in recognition of one’s fidelity in serving God, country, and the Orchard Lake Schools. Fidelitas Medalists are considered for their realization of the religious and cultural ideals of OLS founder, Rev. Joseph Dąbrowski, a Polish missionary priest, who established the original educational institution in Detroit in 1885, and his successors. 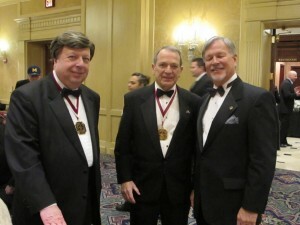 This year the Fidelitas Medal was given on April 13 during the 40th Ambassadors Ball. The Ambassadors and their guests were witness ceremony of the Fidelitas Medal, bestowed upon Edward G. Pinkowski and the late Richard Roger Cosby. The Medals were accepted in behalf of Edward Pienkowski and the late Richard Cosby by Peter Obst and Rita Cosby. Richard Roger Cosby was born on Aug. 4, 1925, in Brzesc, Poland, he became a hero at just 19-years old for his efforts in the historic Warsaw Uprising of 1944. He was captured and taken to Dresden, Germany, to a POW camp. Within six months, he escaped Stalag IV-B and was guided toward U.S. troops and his ultimate freedom. Cosby’s heroics helped him earn the rank of 2nd Lieutenant. His distinguished service was the impetus for Poland to honor him with special commendations, including the Fighter’s Cross, the Gold Medal for Valor from Poland’s Defense Minister, and the coveted Order of Polonia Restituta by the President of Poland – one of the country’s highest honors. highly visible projects, Connecticut’s new interstate highway system and the Niagara Power Plant. Within seven years, and then for almost three decades, he collaborated with Mueser Rutledge in the construction of additions to the Library of Congress, the Dirksen Senate Office Building, the ational Gallery of Art and the Canadian Embassy (Washington, D.C.). The 2013 Fidelitas Medal recipient is Edward G. Pinkowski, who was born on Aug. 12, 1916, in Holyoke, Mass. to Polish immigrant parents. While still in high school, he began what would become a prolific writing career that extended into the U.S. Navy during World War II – a career that enabled him to rise to the rank of chief specialist. During his naval career, he married his wife, Connie (Rosiello). They had two sons, Jack and Jim, while in the nation’s capital during the war. Pinkowski, a former Am-Pol Eagle National Citizen of the Year, was able to share findings with so many others who had come to appreciate his research. On Sept. 18, 1966, some 300 years after Polish pioneer Anthony Sadowski’s birth, Pinkowski erected a monument on his grave as well as dedicating a roadside marker in Douglassville, Pa.
last residence in the United States. Throughout the years, Pinkowski spent countless hours researching Kosciuszko, Pulaski and hundreds of other notable figures. He is the author of several books and numerous articles. The Orchard Lake Ambassadors is a membership of alumni and friends who support the Ambassadors Endowment Fund. Money raised from yearly and lifetime memberships is contributed to the fund and only the interest is distributed to special projects for the Orchard Lake Schools. Past projects have included contributions towards computers for the Seminary, roof work on many buildings throughout the campus, updated security on campus, visiting team bleachers, repairs to the Seminary steps and many other needed projects over the years. Each year, the Ambassadors are invited to attend the Ambassadors Ball. This year the 40th annual event was celebrated at the Townsend Hotel in Birmingham, Michigan on April 13, 2013, and was hosted by First Ambassadors Robert and Patti Koval. Contributions to the Ambassadors Permanent Endowment Fund are designed to provide the future of the Orchard Lake Schools. The principal is untouched; only the interest is used to support the Schools. The levels of membership include: a $1,000 contribution for the annual membership; a one-time $10,000 contribution for a perpetual membership; a $5,000 contribution for a corporate membership; a one-time $50,000 contribution for a perpetual corporate membership; a cumulative gift of $20,000 or more for an extraordinary membership.